Originally designed for Linux operating system, Gimp is a highly customizable video editor used by millions of people worldwide. Thanks to the open source code, you can adjust the program to your own needs. For example, you can add a new plugin, enabling GIMP to perform a new function. How cool is that? By writing just a few strings of code, you can expand the program’s functionality! Furthermore, Gimp is absolutely free and compatible with Microsoft Windows. While Gimp can’t hold a candle to such iconic editors as Photoshop or Corel, it boasts a wide set of tools to create and edit images, logos, and other graphic content. If you need a certain function, you can easily add it to the source code, making Gimp even more powerful! Like any other graphic editor, Gimp has its advantages and disadvantages. Let’s start with the biggest advantage! As mentioned earlier, GIMP is available free of charge. No trial periods! You can download and use this amazing software as long as you like with no payments required. Compared to Photoshop, GIMP takes up less space on your computer and takes less time to install. GIMP is surprisingly easy-to-use. Plus, you can customize the program to meet your needs. GIMP can automatically process images in bulk. This is a very useful feature since photographers often have to make the same changes to a big number of images at once. GIMP opens, edits, and saves images in PSD, which is Photoshop’s native file format. You can download GIMP to your USB flash and process files on any device, whether it’s a computer, laptop, etc. Unfortunately, there is a reverse side to any coin. As convenient and smart as it as, GIMP has its shortcomings. It must be noted that the open source code can be both a blessing and a problem. To a novice’s eye, the GIMP interface may seem confusing and misleading. It takes a lot of getting used to. Some tools on the menu are hard to access. For example, the rotation tool. To rotate an image by 90 or 180 degrees, you need to go to Tools > Transform tools > Rotate. On the contrary, in Photoshop, you simply need to right click on the image. Another serious drawback is that GIMP opens not in one, but in multiple windows. As a result, your computer screen gets cluttered with windows and dialog boxes. Plus, you have to constantly switch between different windows, which slows down the design process. It’s obvious that the developers behind GIMP should focus more on user-friendliness. Designing a logo in such a graphic editor as GIMP won’t be easy. Now don’t say we didn’t warn you! If you already have a logo concept in your head, prepare to put much effort into creating your logo and then making endless changes to it. If you’re firm on making your corporate emblem in GIMP, it’s good to have at least the basic idea of how to use the program. Here are a few smart video tutorials to help you make the most of your creative efforts. Aimed at common users, these video guides will be your best friend in crafting the logo of your dreams. 1. Design logo fonts tutorial (GIMP) no Photoshop. In this video guide, the author shares how to create an amazing custom font for your logo. Certainly worth watching! Check out this tutorial to find out how to use graphic shapes and cropped photos in your logo. Learn how to make a stunning 3D logo. If you want your emblem to turn heads, this is what you need! This video reveals the tricks of creating a professional logo for your photography business. Here is a great opportunity to draw a simple dragon logo using the standard GIMP tools. From this video tutorial, you’ll learn how to turn a face photo into a logo and add the galaxy vibes to it. While not a common choice among designers, this is, hands down, an original and memorable logo concept! Find out how to create a beautiful logo from a photo and apply the mesmerizing golden dust effect in the background. A must-watch for those vying to stand out from the crowd. A great solution for hair stylists and other professionals in the beauty industry. The author shares his way of designing a triangle logo using the photo of a person. The result has surpassed our expectations! What’s your take on it? A detailed video tutorial on exploring the football theme in logo design. If your brand has to do with football or sports in general, be sure to grab a pencil and take notes! If these video tutorials discouraged you from creating a logo in GIMP, we have an easier route for you! Why spend hours working on a logo when you can get the same result in 5 minutes? 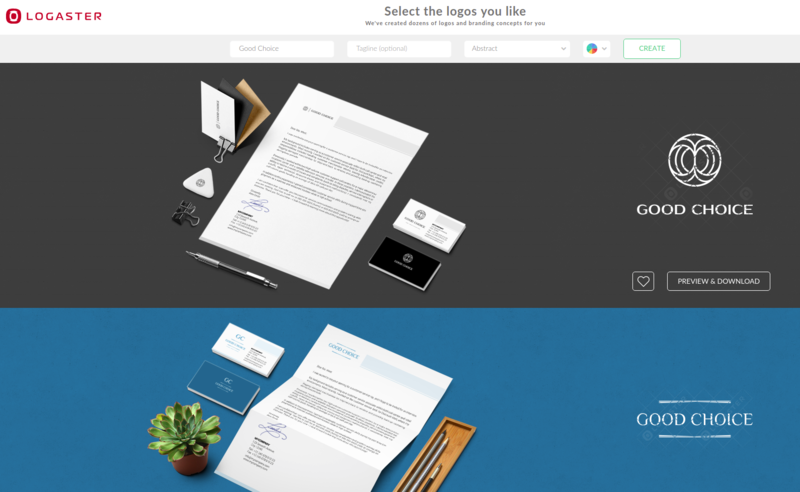 Try Logaster, a smart logo-making service that enjoys the trust of millions! Making a logo with Logaster is a walk in the park! Using Logaster, your zero design skills is not a problem at all. In just a few minutes, you’ll be looking at your own corporate emblem! You can edit your freshly created logo as much as you like. Plus, we give you a great opportunity to design a full branding package based on your logo. When it comes to creating a logo for your business, you’re free to choose any method. If you’ve opted for GIMP graphic editor, it won’t hurt to watch one or two video tutorials first. If, however, mastering GIMP is too overwhelming for a novice like you, you should let a clever logo generator take the reins. With a logo maker like Logaster, creating a professional logo takes just a few minutes. We bet you can make a better use of time saved!